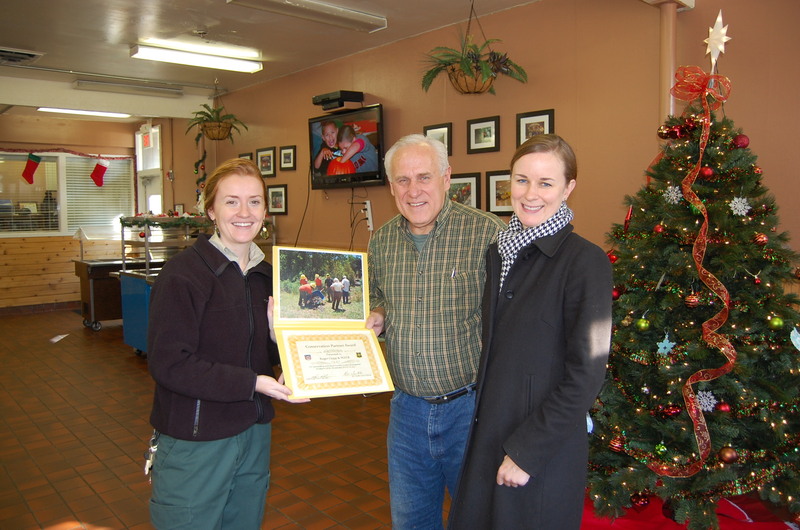 Holly Krake, left, a US Forestry worker and liaison specialist for the Oconoluftee Job Corp CCC Center, presents Roger Clapp, excutive director of WATR, a Conservation Partner Award in recognition of WATR’s work with Job Corps students on the Monteith Park trails project in Dillsboro. Job Corps students have helped cut trails, erect signs, build steps, and clear invasive plants at the Scotts Creek Stream Buffer Demonstration Trails. At right is Jennifer Cooper, WATR member and MFP teammate. This entry was posted in Partnership Award and tagged Watr award. Bookmark the permalink.